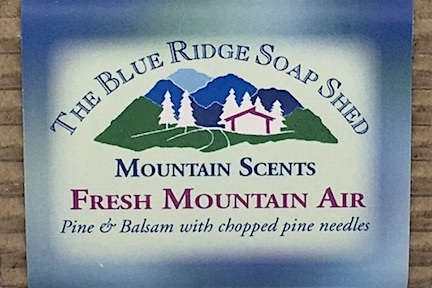 Our Mountain Scents Soaps are our aromatic souvenir line of handmade soaps that celebrate the scents and botanicals of the South and Blue Ridge mountains, originally created back in 1998 for tourists visiting our region. Enjoy herbs of peppermint and sassafras in our Blue Ridge Mint, chopped fine pine needles in our Fresh Mountain Air Soap, and scent combinations created to celebrate the traditional floral fragrances of the South - Rose, Magnolia and Gardenia. With as much rain and fog as we see up at this elevation, we've created two beautiful water scents: Mountain Rain and Woodland Rain. Mountain Rain is a little sweeter, Woodland Rain a little fresher and lighter. And yes, we've even got Kuzdu Soap, that hard to grow vine that frustrates all of us in the sunny South. Although you only get to see them a couple months each summer, the Kudzu vine actually has a pretty purple flower that exudes a grape scent. We've got that scent too! With Mango, Apricot, Vanilla and a couple other secret ingredients, this scent smells suspiciously like a Tequila Sunrise! This dynamite combination of peppermint, vanilla and ground mountain grown sassafras root is a no-cal, all-over Peppermint Patty for your body! Gentle fragrances of heather, hyacinth and wildflowers in this soap remind you of walks through mountain meadows. A mixture of mints, herbs and warm resins, this relaxing scent will relieve the stresses of the day, along with the winter doldrums. The Cherokee heritage of the western North Carolina mountains comes alive with these three fragrances of sage, sweetgrass and cedar. Enjoy your memories of Blue Ridge fresh mountain air with this pine & balsam soap containing flecks of real pine needles. This Kudzu soap captures the elusive scent of the Kudzu vine that grows on everyone who visits the Sunny South. Wake up to this soap and the scent of sweet mountain peppermint, and the gentle exfoliants of poppyseeds. This soap is just like the fresh, light scent of mist in the Blue Ridge after a Summer rain. How did Scarlett O'Hara conquer Rhett Butler and every man in Dixie? Could be the irresistable southern scents of magnolia, gardenia, and a touch of rose in this soap. Three bars, one each of our Mountain Morning Wake Up Call, Carolina Kudzu, Fresh Mountain Air. Minimum weight nine ounces, equivalent of 1.5 bars of our soap. Six bars, one each of our Mountain Morning Wake Up Call, Carolina Kudzu, Blue Ridge Wildflowers, Southern Belle, Fresh Mountain Air, and Appalachian Sunrise. Our popular mountain souvenir soaps along with the 'classic' scents The SoapShed started out with years ago.